Three Wires Cardboard Paper Machine, mainly used for making kraft paper, testliner carton paper. 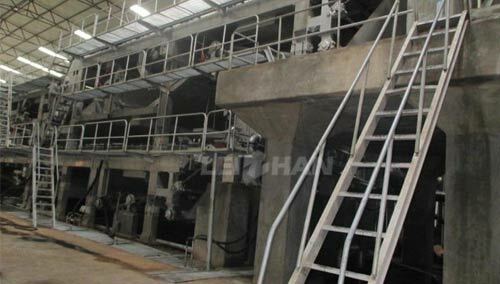 Paper machine line is mainly divided into several parts as below: Head Box, Foundrinier Part, Press Part, Front drying Section, Inclined type Surface Sizing Machine, Back Drying Section, Calendering Part, Paper Reeling Part. Φ1500/Φ1800 Dryer , group drive, equipped with Wire Leading Roll, Dry Wire, Sealed Gas Hood. Double Rolls Calender, Upper and Lower Rolls are Metal Roll, the pressurized motion is corrugated air tire pressure. 9. Reeling Part: Pneumatic Horizontal Reeling Paper Machine, the pressurized motion is cylinder pressure.